Hekinan (碧南) is the temple town with many traditional houses that have a great view of Samurai Era. It is located in southern Aichi Prefecture. There is the oldest remaining Mirin Brewery in Japan. Their large storage is registered as the national important cutural assets and opened for public. It has a great Japanese Eel restaurant as well. 1. use Meitetsu Mikawa Line to Hekinan Station. Hekinan is the temple town located in southern Aichi Prefecture. It is also known as the town with many traditional houses. 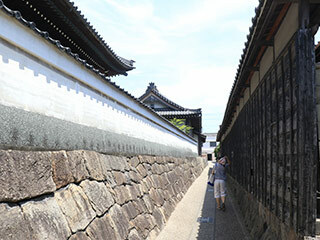 Those traditional houses and temples create the feeling of the Samurai period. Also, there is an established Mirin Brewery called Kokonoe Mirin. They established in 1706 and they have the oldest Mirin Storage in Japan. They offer the brewery tour. This buiding was constructed in 1706 and registered as the national important cultural assets.